Inline industrial refractometer for boiler cleaning acids. Chemical cleaning has been considered a necessary part of boiler maintenance for many years. The objective of a chemical cleaning is to safely remove all the deposits from the inside of the boiler tubes. Proper chemical cleaning removes deposits from the inside of boiler tubes which improves the boiler heat rate, reduces tube failures and improves the stability of boiler chemistry. However, chemical cleaning can cause severe damage to the boiler if proper chemical dilution is not maintained. The MPR E-Scan allows chemical cleaning companies the ability to control acid dilution to strict specification. This insures the proper cleaning dilution is achieved while reducing the risk of over shooting the target control point causing costly damage. 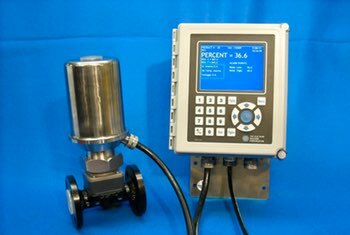 By installing the instrument in-line after the dilution point, the MPR E-Scan provides real time control, trending and data logging information to operators insuring the required chemical dilution is achieved and remains constant. This will reduce the overall time needed to meet target dilution, saving time and minimizing the boiler downtime. The MPR E-Scan can be constructed of various alloys to ensure a long service life in a harsh chemical environment. By utilizing the instrument to control and monitor the cleaning solution, chemical cleaning companies can assure customers that proper dilution was met and maintained. When the job is completed, the cleaning company can provide their customer with documentation of both the process dilution and temperature throughout the entire cleaning process. Multiple product ranges and configurable set points. Configurable alarm points: high/low, setpoint/ deviation, etc.